For my 700th blog post here I thought I would reflect on university histories. Given their nature it’s often struck me as rather surprising that universities and their staff tend not to have a well developed sense of institutional history. Research matters to universities but they tend not to prioritise maintaining their own records for future researchers. It’s possibly that universities are generally not brilliant at comprehensive record keeping because of their devolved nature and more recently because of the shift from paper to digital but nevertheless there are core records around, for example see Nottingham’s institutional collection. Plus there is enough oral history available from longer established staff to last a lifetime if you ask for it. Anyway, my contention is that staff at every level of the University need to know more about their institution’s past. Not surprisingly they didn’t do terribly well. Even though these were the easy questions. Recently, the University commissioned a new history primarily to cover last the 20 years or so of institutional activity and capture some of the most major changes at Nottingham, including in particular the establishment of the international campuses in Malaysia and China. We were also keen to ensure we recorded a lot of learning and information in a more comprehensive archive than would be publishable (also recognising that the pace of change and move from hard copy to electronic has made record keeping more problematic) but which would be a valuable resource for future historians. The previous history (in two large volumes) by Dr B H Tolley covered mainly the period 1948, the year the institution received its Royal Charter, through to 1988, with plenty of material too from the earlier period of the operation of University College Nottingham since its inception in 1881. The last history. Not very portable. Whilst Tolley’s magnum opus offered comprehensiveness it lacked a certain degree of readability. I believe there are still copies available through Amazon (although not at bargain prices). Beyond this though there are other accounts of the University of Nottingham, its Vice-Chancellors and the estate. 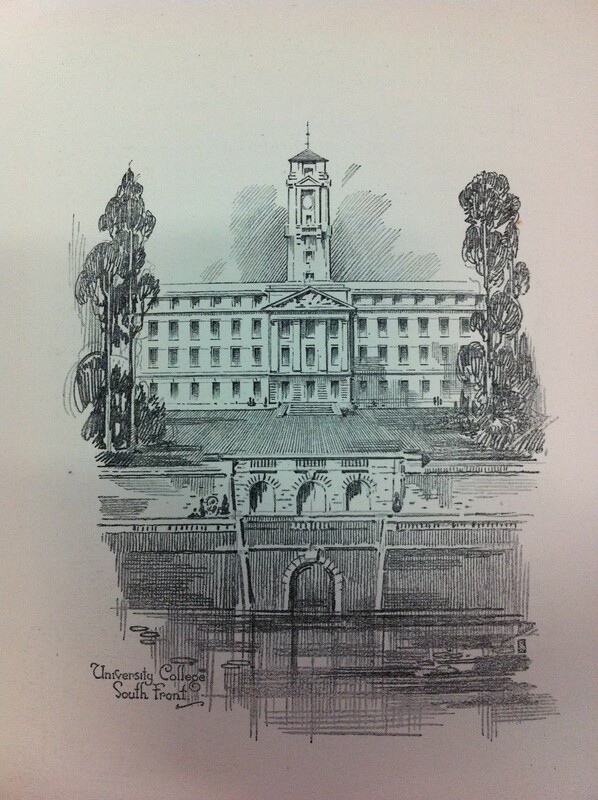 A previous post commented on the souvenir brochure from this event which included more details of the Trent Building design. At the moment of the opening by His Majesty the King, when the stones of the coming University are still unweathered by time, it is difficult to appreciate the full significance of this educational development. Thousands of students yet unborn will pass along the corridors and learn in the lecture rooms, and wrest the secrets from nature in the laboratories. Their work will link still more closely industry with science, add to the honour of the City and help to increase the well-being of our nation. The significance of this is that there is a common thread running from Boot’s original vision for the new University College through the Royal Charter to the current strategy of the University. There are other important milestones in the University’s history. 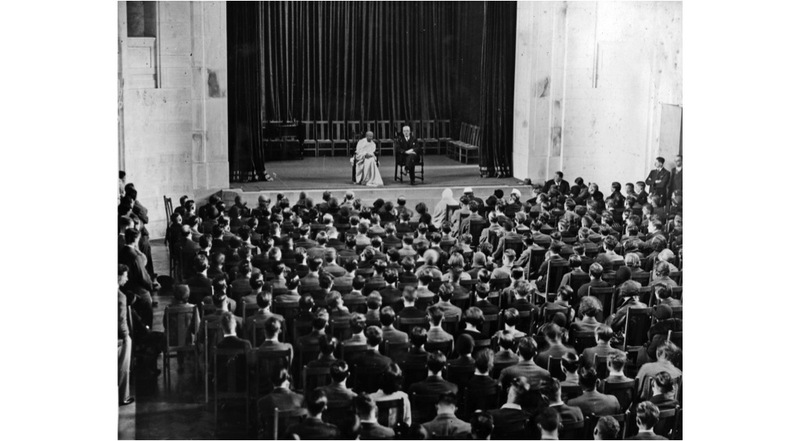 For example, knowing that Gandhi spoke to a packed Great Hall back in 1931 gives additional depth to our international strategy. Remembering that students campaigned very hard to secure Senate representation over a number of years in the late 1960s and that in 1968 John Dunford, President-elect of the Students’ Union (and recently awarded an Honorary Degree by the University), was the first student to address the Senate. And of course the cultural landmark that was the first public performance by Paul McCartney and Wings back in 1972. It must not, however, be thought that the road was smooth, for the obstacles were many. Many of the prosperous bourgeois of the city were inclined to scorn the College because it appeared too democratic, while others openly scoffed at spending money on such subjects as Classics or Philosophy. But it met local needs, and students who were not confined to any special class came from the whole district. Decisions taken by staff at all levels of our universities today are not context free. We can all learn from what went before so that we build on our history and are not trapped by it. But we do have to know it first. We of today owe more than we can express to our forefathers…The Council and Senate of the University College are not unmindful of their responsibilities, and assure all those into whose hands this book may pass, that they are resolved that the great ideals of Sir Jesse for a University with the complete right of self-government, and the power to shape its courses to meet the special needs of local industries and conditions, shall be accomplished to the full. The gifts recorded in this book and offered to the People’s University will assuredly bear fruit for all time. Anyway, I’m now really excited by the prospect of the publication next year of a new history of the University of Nottingham. It’s being prepared by very wonderful and diligent Professor John Beckett of the School of Humanities and will bring things up to date as well covering some of the earlier history in outline. 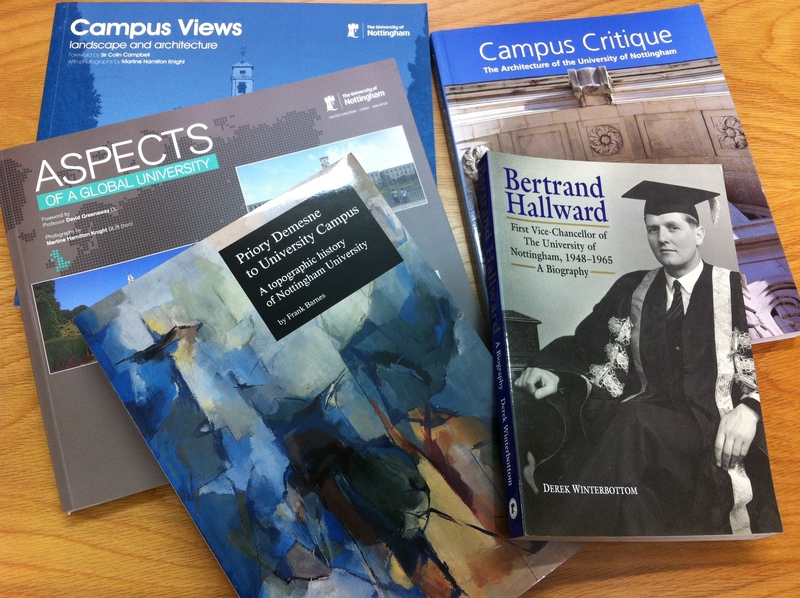 It will I hope also have the advantage of being highly readable, and including much more material about students and the student experience (largely neglected in previous publications) and, rather marvellously, will have pictures too. will tell in due season how the University College won its Charter, and thus Nottingham became the seat of a great people’s University, which in each succeeding age will spread the light of learning and knowledge, and will bind science and industry in the unity that is so essential for the prosperity of the nation and the welfare of our fellow citizens.